A new Danish statistical study finds that "Muslims [are] 218 percent more criminal in second generation than first." While some of these crimes are clearly related to Islam—such as attacks on Muslim apostates to Christianity—others, such as rampant theft of non-Muslims, would appear banal, until one realizes that even robbery and plunder is justified by Islamic doctrine—as one UK Muslim cleric once clearly said. The interesting question here is why are second generation Muslims, who are presumably more Westernized than their Muslim parents, also more "radical"? Lest one dismiss this phenomenon as a product of economics or some other "grievance" against European host nations, the fact is, even in America, where Muslims are much better assimilated than in Europe, they too are turning to "radicalism." For example, some time back, Attorney General Eric Holder said that "the threat [of terrorism] has changed … to worrying about people in the United States, American citizens—raised here, born here, and who for whatever reason, have decided that they are going to become radicalized and take up arms against the nation in which they were born." For many years we lulled ourselves with the idea that radicalization was not happening inside the United Sates. 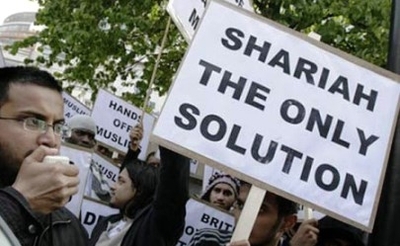 We believed American Muslims were immune to radicalization because, unlike the European counterparts, they are socially and economically well-integrated into society. There had been warnings that these assumptions were false but we paid them no mind. Today there is no doubt that radicalization is taking place inside America. The strikingly accelerated rate of American Muslims arrested for involvement in terrorist activities since May 2009 makes this fact self-evident. Myrick named several American Muslims as examples of those who, while "embodying the American dream, at least socio-economically," were still "radicalized," astutely adding, "The truth is that if grievances were the sole cause of terrorism, we would see daily acts by Americans who have lost their jobs and homes in this economic downturn." Quite so. Yet, though Myrick's observations were limited to the domestic scene, they beg the following, more cosmic, question: If American Muslims, who enjoy Western benefits—including democracy, liberty, prosperity, and freedom of expression—are still being radicalized, why then do we insist that the importation of these same Western benefits to the Muslim world will eliminate its even more indigenous or authentic form of "radicalization"? After all, the mainstream position evoked by most politicians maintains that all U.S. sacrifices in the Muslim world (Iraq, Afghanistan, etc.) will pay off once Muslims discover how wonderful Western ways are, and happily slough off their "Islamist" veneer, which, as the theory goes, is a product of—you guessed it—a lack of democracy, liberty, prosperity, and freedom of expression. Yet here are American and European Muslims, immersed in the bounties of the West, and still do they turn to violent jihad. Why think their counterparts, who are born and raised in the Muslim world, where Islam permeates every aspect of life, will respond differently? In fact, far from eliminating "radicalization," Western values can actually exacerbate Islamic tendencies—hence why second generation, "Westernized" Muslims are also becoming more "radicalized" than their parents. Some already known that Western concessions to Islam—in the guise of multiculturalism, "cultural sensitivity," political correctness, and self-censorship—only bring out the worst of Islam's "schoolyard bully." Yet even some of the most prized aspects of Western civilization—personal freedom, rule of law, human dignity—when articulated through an Islamic framework, have the capacity to "radicalize" Muslims. Consider: the West's commitment to the law as supreme arbitrator, for the Westernized Muslim becomes a commitment to establish and enforce Islamic law, Sharia; the West's commitment to democracy, for the Westernized Muslim becomes a commitment to theocracy, including an anxious impulse to resurrect the caliphate; Western notions of human dignity and pride, when articulated through an Islamic paradigm (which sees only fellow Muslims as equals) induces rage when Muslims—Palestinians, Afghanis, Iraqis, etc.—are seen under Western, infidel dominion; Western notions of autonomy and personal freedom have even helped "Westernize" the notion of jihad into an individual duty, though it has traditionally been held by Sharia as a communal duty. In short, a set of noble principles articulated through a foreign paradigm can lead to abominations. In this case, the better principles of Western civilization are being devoured, absorbed, and regurgitated into something equally potent, though from the other end of the spectrum. Put differently, just as a stress on human freedom, human dignity, and universal justice produces good humans, rearticulating these same concepts through an Islamic framework that qualifies them with the word "Muslim"—Muslim freedom, Muslim dignity, and Muslim justice—leads to what is being called "radicalization."